What is the need for scoliosis surgery? Surgery is recommended for people with curvature that is higher than 45-50 degrees. The need for this surgery is to reduce the curvature and to prevent further development of the curve. You see, the curvature starts and continues through the growing process. Once the deformity is addresses earlier in life, the better. This is because the curve can become quite extreme if it is left unnoticed and can result to disfigurement and compromising the cardiopulmonary systems. It can also cause pain in adults in later life and this can also one situation that will require a scoliosis surgery. Thanks to our modern technology today, scoliosis surgery is easier because of the developments in tools and instruments used in the surgery. With the help of advanced tools and instruments, they can now be precisely attach rods and screws to straighten the back. Once the back heals, the bone fuses to the implanted rods in the new corrected position. Scoliosis surgery will take about six hours and it will be performed in the posterior position. There will be a long incision running the length of the thoracic spine that will allow the surgeon to pull away the muscle to get to the vertebrae. The rods and screws are placed in the appropriate position and then bone dust from the patient’s hip is added to facilitate fusing of the existing bone to the rods. There is also a scoliosis surgery that has an anterior approach. This is usually done when the curvature is near the region where the thoracic portion of the middle back meets the low back lumbar region., lower than most scoliosis cases. In this case, a rib will be regularly removed to allow better visualization of the back and the discs are removed from the between the vertebrae as well. Once you undergo scoliosis surgery, expect to be in the hospital for at lest six days to allow proper healing after your surgery. Once you are allowed to leave the hospital, your back will be straighter and most of the rib prominence corrected. You should limit your activity to walking, sitting and standing and make sure not to do any physical activities that will need exertion. After three months, you can do more activities but no athletic activities yet. Usully, you can do all the activities you used to after a year. This entry was posted in Scoliosis in Adults on March 5, 2012 by FindItOnline. A scoliosis brace is one of the most widely accepted treatment for scoliosis especially for children and adolescents. Such brace is customized to suit the different needs of patients and to be used to prevent the spinnal curve from worsening during the growing age. However, this can’t rectify the existing spinal curve in patients. Thoraco-Lumbo-Sacral-Orthosis(TLSO) – also known as “Boston brace” and sometimes referred to as an “underarm brace”. This scoliosis brace is the most common form of TLSO and is fitted to the body of a child and custom molded from plastic. You can wear it under you clothes and it won’t be noticeable. It is advised to be worn 23 hours a day and you can take it off when you will swim, play sports or participate in gym class. This particular scoliosis brace is given for curves in the lumbar of thoraco-lumbar part of the spine. Cervico-Thoraco-Lumbo-Sacral-Orthosis – also known as the “Milwaukee brace”, this is very similar to the TLSO but this one has a neck ring held in place by the vertical bars that are attached to the body of the brace. It can also be worn 23 hours a day. This is precribed for curves in the thoracic spine. Charleston Bending Brace – also known as the “nighttime brace” because it should only be worn while sleeping. This scoliosis brace is molded to the patient while they are bent to the side to apply more pressure and bends the child against the curve. Such pressure can improve corrective action of the brace. Bracing is very important for patients with curves measuring between 25-40 degrees and showing a progression of 5 degrees or more, every 4-6 months. A scoliosis brace is made and fitted to suit each individual curve and this should be done by an orthoist after your orthepedic specialist recommended bracings. You will be given specific instructions on the use of a scoliosis brace. When it comes to the effectiveness of it, it can be evaluated through periodic check-ups and X-rays. It is also recommended that patients do regular exercises along with bracing to keep their bodies flexible and maintain spinal and muscle strength. 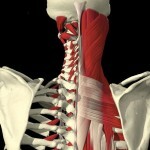 This entry was posted in Scoliosis in Adults on February 21, 2012 by FindItOnline. Why should you consider yoga for scoliosis? The body with scoliosis has developed a highly sophisticated ‘act’ and it can learn a more refined symmetrical ‘act’ with proper instruction. With the combination of yoga postures and breathing awareness, a person with scoliosis can develop a structural alignment which can create a symmetrical alignment. This can be done by stretching the muscles that have tightened and strengthening the muscles that have worn down from this asymmetrical imbalance. With this exercise, the body will be able to make an effortless posture with the use of the bone structure rather than letting the muscles work harder to hold itself up. Through yoga, a person can find that balance point that will allow the scoliosis curve to coexist with gravity. It will also activate the natural plumb line of the body which will result to less pain and better posture. If you choose to do yoga for scoliosis, remember that it requires commitment and inner awareness from you. It is essential that you do not expect perfection but instead, you must learn to accept yourself and locate your optimal alignment and center. As there is beauty in the straight alignment of a palm tree, there is also the beauty of an oak tree with its many twists and turns. Yoga for scoliosis is very empowering. It will give you hope to do something to improve your condition and your quality of living. It seems like yoga is one of the best ways for people who have scoliosis to try out. It can help them relax and at the same time, teach them discipline and motivation. However, this is not a form of treatment but more of a self-help program. Yoga programs for scoliosis can be found online. You can also search for yoga practices around your area. You will surely find the best one for you. In addition, you can ask your doctor for referrals. Keep in mind that before you do yoga, you must have your doctor’s approval beforehand. 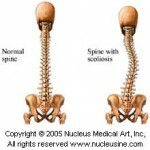 This entry was posted in Scoliosis in Adults on December 13, 2011 by FindItOnline. If you have scoliosis, it is very important that you do scoliosis exercises. These exercises are designed to correct and improve the lateral and rotary curvature of the spine and can also lead to an increased stability of the back, stronger muscles, improved flexibility and better muscle balance. An exercise can also produce good results when performed regularly. However, physical activities are not a treatment for scoliosis. But they can certainly help. Scoliosis exercises cannot stop the progression and worsening of the curve. However, they can help minimize the decrease in the functional ability of the spine caused by scoliosis. There are some workouts that are designed to make muscles of the back, shoulders, and upper back flexible and strong. Most of them are complex enough to require supervision from a physical therapist. However, there are also simpler exercises that you can do on your own at home. These workout routines are done to improve the spine’s mobility. There are weight-bearing routines like gymnastics, walking, running, and soccer. These can reduce the risks of developing osteoporosis. Children and adolescents who have scoliosis are recommended to be physically active. They should participate in sport activities to help with muscle strength and to strengthen their backs as well. These activities can also help improve posture. For those who have serious cases of scoliosis, these workouts are not recommended. A specialized doctor should be consulted first. Scoliosis exercises can help a lot. In addition, there are yoga exercises that are said to be useful when it comes to giving substantial relief from scoliosis. Yoga can help restore the normal shape of the spine and it can also increase function and mobility. It has also been found to be effective when it comes to dealing with scoliosis. Yoga exercises are known to assist in raising a patient’s lowered shoulder as well as alleviating constant back pain. Don’t be afraid to try some of these physical activities. It is always better that you have your condition assessed first before doing any of these workout routines. Stay active and healthy so that you’ll feel better and stronger. 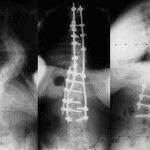 This entry was posted in Scoliosis in Adults on December 6, 2011 by FindItOnline. Are you diagnosed with mild scoliosis? You do not have to worry because there is no need for a surgery. For milder cases, there are alternative treatments that may provide benefit, although the medical community has not fully determined the extent of these benefits. Brace – this is the most common treatment for mild scoliosis. The wearing of a back brace. The brace is usually made from plastic and metal. It forces the spine into the correct position and posture. Massage – muscle manipulation through massage is used in scoliosis treatment because tight muscles can pull on the vertebrae of the spine. Chiropractic – this treats scoliosis physically by putting the vertebrae of the spine back into correct alignment quickly. Exercise – this can help stretch out the ligaments and muscles attached to the spine and thus, can also help improve blood flow. The best exercises are those that are low-impact and isometric. Electro-stimulation – this kind of treatment uses a mild current which is allowed to run through the muscles around the affected area. This approach is known to activate and strengthen the muscles needed to correct the curvature of the spine. Physical therapy – this usually involves doing streteches to counter the curve of the spine and strengthen the muscles needed for correct posture. It is often combined with an exercise regimen. For those who have mild scoliosis, these treatments are very easy. In fact, doing such treatments like exercise will not only help you with your condition but can also help you become fit and healthier overall. Aside from these treatments, it is also important that you have a well-balanced diet and be hydrated at all times. Mild scoliosis should not be a cause for alarm because it is not critical and will not require serious treatments. If you are concerned about your scoliosis, you can always consult your doctor. Make sure that you are checked regularly so that you can have the curve of your spine measured. Talking to your doctor will make things a lot better because you will be more assured that there is really nothing to worry about this disease called scoliosis in adults. 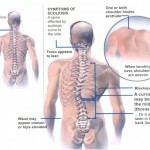 This entry was posted in Scoliosis in Adults on November 23, 2011 by FindItOnline. What are the causes of thoracic spine pain? First of all, the thoracic spine is comprised with 12 vertebrae which are separated by discs and attached laterally to the ribs. There are different conditions that can create varying degrees and types of pain in the thoracic spine. Few of which are life threatening. Sprains are the most common, least serious but sometimes the most painful. Tumors are the least common, most serious but sometimes do not generate much pain. This is quite the ironic side of thoracic pain and usually leaves some patients very frustrated especially when they don’t know yet the diagnosis of the pain they are feeling. Spondylosis – this is the wear and tear type of spinal arthritis. This is common among both genders beyond the age of 45 and it usually involved disc degeneration and bone spur growth. During the early stages of spondylosis in the thoracic spine, it creates an achy stiffness between the shoulder blades and sometimes laterally around the rib cage. Usually, this stiffness is worse in the moning but abates with activity. Later stages of degeneration can irritate the nerve roots and create an intermittent, burning pain. Fractures – experiencing deep, dull, constant pain can be caused by fractures. Osteoporosis is the most common cause because o fthe reduced bone density which leads to compression fractures. Scoliosis – this is an unnatural lateral curvature of the spine and is the most common in the thoracic region. This usually occurs in adoloscent females and is of unknown cause. Pain from scoliosis can range from nonexistent to severe, depending on the degree of deformity and flexibilitu of the afflicted area. If there is a severe deformity, then thoracic spine pain and tightness can result from simply breathing. Sprained joints – this is the most commnon sourse of thoracic spine pain and can be the most severe. There are two types of joints that becomes compressed or misaligned which are the facet joints and the costrovertebral joints. The facet joint is often sharp with restricted movement, whereas costovertebral pain is stabbing or like and ice pick. A severe, left-sided costovertebral sprain can mimic a heart attack in presentation. Disc herniation – this can occur in the region of the thoracic but they are not common. Trauma is the most common cause of thoracic herniations. It can irritate nerve roots which can cause a bvurning or shooting electric pains especially around the rib cage. Infection – spine infection is a serious disease and this can become life threatening without antibiotics. These are some of the causes of thoracic spine pain. This will be very helpful for you and can serve as a guide especially if you have scoliosis in adults. If you have Scoliosis and you are experiencing Scoliosis pain, this may be caused by the physical spinal curvature. Some patients don’t experience any pain from their conditions. A lot of patients who do have pain are actually suffering from psychosomatic symptoms often brought on by the diagnostic nocebo effect of the curvature, rather than the curvature itself. Having scoliosis in relatively common and the majority of patients have very mild curves that don’t need any treatment whatsoever. Most mild spinal curves will not cause any pain or even be noticeable to the patient or others. For those who have moderate to severe scoliosis, feeling scoliosis pain is very rare but it needs to be monitored. Some severe caused of scoliosis actually do compromise the integrity of the spine and can cause pain in the spinal structures, back muscles or internal organs. True scoliosis pain from advanced scoliosis should be medically treated and possibly, in a surgical way. It is unfortunate that medical science doesn’t have many options when it comes to scoliosis correction. Now, let’s move on the psychosomatic scoliosis pain. Out of the minority of scoliosis patients that don’t experience pain, most are suffering from a psychosomatic reaction to the nocebo effect of the diagnosis. This simply means that the patient has been frightened by being diagnosed with scoliosis and the mind takes the opportunity to create painful symptoms based on expectation, rather than biological causation. This type of pain can’t be treated successfully using drugs or surgery. The only cure for psychosomatic reaction is knowledge therapy. This is the only treatment that treats the actual psychological/emotional cause of the symptoms. For patients who are complaining of scoliosis pain or feel threatened that they might experience scoliosis pain, it is crucial to reassure a patient about the truth of their scoliosis condition. You have to make sure that they understand that mild to moderate spinal curvature is almost never painful and will not cause any disability. This is very important in young patients and those who have scoliosis in adults that are prone to fear, insecurity and exclusion due to their spinal curves. Parental and peer support can make the difference between a life filled with satisfaction and a life dominated by pain. Consider all these things before you reassure yourself that you’re feeling scoliosis pain. Keeping in mind all these things will help you be more knowledgeable and will take your worries away. If you are experiencing pain in your back, you have uneven shoulders and waist, then you might have adult scoliosis. This is an abnormality in the spine that occurs during adulthood or is a continuation of the disease that was undiagnosed or ignored during childhood or adolescence. Generally, adult scoliosis is idiopathic which means that the cause is unknown. However, there are a few types of scoliosis that occurs in adults like congenital curve, paralytic curve and myopathic deformity. What is a congenital curve? This is present at birth and if left undiagnosed, it can worsen in adulthood due to age and weakening of the spine. What is a paralytic curve? This may be caused by an injury to the spine. This can result to diseases like polio or cerebral palsy. Those who have are feeling signs and symptoms are encouraged to visit their doctors. They will be asked to go through a series of tests to determine the diagnosis or to determine scoliosis in adults. Usually, medications are recommended by doctors for pain relief that is brought by scoliosis. It is also recommended to exercise like walking, cycling and swimming. These things will help the body to be fit and maintain a correct posture. These can also counter the deforming effect of scoliosis and it can also help reduce pain. There are also physical therapists that can help you with your adult scoliosis. They have exercise programs to suit the different needs of patients. Bracing in adults is used to ease pain and discomfort rather than prevent worsening of the curve, while surgery is generally used as the last resort. A surgery only become essential in adult scoliosis if the spinal curve is greater than 50 degrees and is accompanied by continuous pain. It is also conducted if the curve is increasing as this can cause heart and lung problems. In some cases, deformity caused by the disease necessitates surgery. To put it in a nutshell, adult scoliosis can be avoided through proper treatment of the disease in its early stages, during childhood or adolescence. The earlier the treatment commences, the lesser will be the pain and discomfort, and chances of surgery. A healthy lifestyle can also alter the occurrence of it during adulthood.